A caterpillar walking along a bike path. I found this fellow along the bike path at Lake Champlain in Burlington, Vermont. He was off to the side just trucking along. 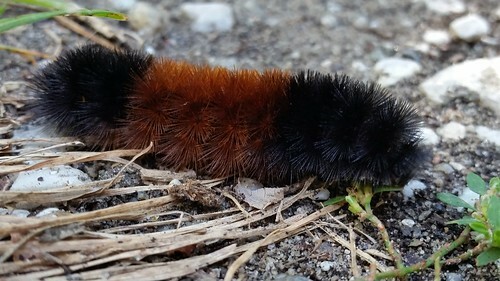 I always found these caterpillars (I'm assuming it is a caterpillar) intriguing compared to the more common ones I encounter (they are typically yellow and black without as much hair). It always makes me wonder what kind fo butterfly it is likely to become or if there is any correlation between the hairiness and the butterfly that emerges. I also have a memory--and not sure if this is a memory or a dream--of touching one of these things and the hair almost disappearing instantly. I'm pretty sure it was a dream but it is one that was so strong that decades later, it still comes to mind whenever I encounter one of these guys.